The fourth wall on this game is regularly broken. In the early 1990’s, a certain style game was popular on computer systems. The Point & Click. These games revolved around having a character you control by clicking on the screen, and having them interact with objects on the screen. These games were largely story driven, and the games lived & died on both the story and puzzles involved. 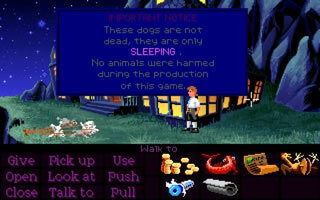 If you want to explore this genre, there’s one game to go to – The Secret of Monkey Island. 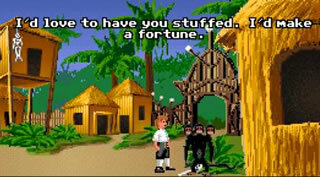 Based in the swashbuckling carribbean island of Melee Island™, the Secret of Monkey Island (SOMI from now on) features the travells of Guybrush Threepwood, and his quest to become a mighty pirate. The game is split into a number of parts, each featuring a goal to achieve. To achieve this goal & to complete the parts in order, advancing the storyline you need to solve a range of puzzles. They range from the serious and fairly obvious (use key, open door) to silly and confusing (open rubber chicken, find pulley, use pulley on zip line). This game is tough, but luckily – save for one moment in the game (where you’re thrown into the river tied to a heavy weight, and you spend more than 10 minutes underwater) – it’s impossible to die. The story is a typical pirate story, with various twists & turns. LeChuck, a ghost pirate, has captured Governor Elaine Marley for her to be his bride on Monkey Island, and it’s upto Guybrush to rescue her. Sounds like an average Pirates of The Carribbean story, right? Well, imagine if instead of Disney’s making Johnny Depp’s finest hour, imagine it made by Monty Python. The humour really makes the game, with a sympathetic yet self depreciating hero, a damsel in distress who isn’t really in that much distress, and a villian who’s more buffoon, than evil. Throw into that some of the most quotable humour in a computer game, and you have yourself a classic. The cast of this game is relatively small, with about 4-5 main characters, and only about 10 characters actually establishing themselves with decent dialog (the rest of them are simply “pirates”). The humour is based around breaking the fourth wall & also putting present day sterotypes into a classic setting. Throw onto that decent graphics (though it can be tricky to see what you need to click on) and spacious music which is neither here nor there, and it makes a great game. You could get the Commodore Amiga version of this game, however recently Microsoft released the game on it’s XBox Live Arcade system, allowing a new generation to enjoy the game. It’s not a straight copy – it’s received a graphic update similar to Super Street Fighter II: HD Remix. However, it also received speech (which does add to the game, however you’ll probably want to switch subtitles on as well), a new interface and a hint mode (which annoyingly makes the game incredibly easy). All but the hint can be switched off by pressing the XBox’s “Back” button, which switches the game into classic mode, which is handy as some puzzles (such as the sword fighting) is easier in HD mode, whereas others (breaking the prisoners’ lock) is easier in classic mode. For the princely sum of 800 points, it’d be rude not to play this game, be it an education in a forgotten genre, or getting reacquainted with an old love.